Even though electricity and heat production increased by 21 % in the 1990-2006 period, CO2, emissions increased “only” by 10 %, predominantly due to a greater efficiency of production. SO2 emissions reduced by 95 % due to the installation of desulphurisation devices and a greater production efficiency, and NOx emissions by 27 % due to the implementation of primary measures on installations used for the reduction of NOx emissions (installation or replacement of burners, etc. ), the improved methodology of calculating emissions and a greater production efficiency. Statistical Office of the Republic of Slovenia, 2009; Environmental Agency of the Republic of Slovenia, 2009. In 2007, the electricity and heat production sector contributed 32 % of total CO2 emissions, 59 % of total SO2 emissions and 28 % of total NOx emissions, making it very important for achieving national targets. Information on which measures yield the anticipated results and which are failing is therefore crucial for a timely adaptation of our strategy for reducing emissions. In 2007, electricity and heat production contributed 6565 kt of CO2 emissions, 8.35 kt of SO2 emissions and 12.47 kt of NOx emissions making it the largest source of CO2 and SO2 emissions and the second largest source of NOx emissions (the largest being transport). In the 1990-2007 period, SO2 and NOx emissions reduced by 95 % and 27 % respectively, while CO2 emissions increased by 10 %. In 2007, CO2 emissions increased by 4 % and SO2 and NOx emissions decreased by 14 % and 5 % respectively. In 2007, electricity and heat production was 21 % greater than in 1990 and 2 % smaller than in 2006, especially due to a lower demand for heat. • Increase in the share of non-fossil fuels, such as power production from renewable energy sources and nuclear produce. As regards renewable energy sources, it needs to be said that wood biomass produces SO2 and NOx emissions, but is generally stated to have zero net CO2 emissions. Therefore, when considering emissions of CO2, biomass is regarded as a renewable energy source and when considering SO2 and NOx emissions, as part of fossil fuels. • Increase in the efficiency of electricity and heat production from fossil fuels. This can be achieved both by improving production efficiency at existing plants as well as constructing new ones and by increasing production of electricity in combined heat and power plants. • Change in the mix of fossil fuels used for electricity and heat production. Coal (brown coal and lignite) and fuel oil contain significant amounts of carbon, sulphur and nitrogen, which react with oxygen during combustion to form emissions that cause damage to the environment. Natural gas contains significantly less of these chemicals and is therefore more environmentally acceptable. - Flue gas desulphurisation (FGD) substantially reduces SO2 emissions. The most common is the wet calcite flue gas desulphurisation method based on the absorption of sulphur dioxide from flue gases using slurry where it forms a stable product together with the calcite. - Primary (combustion modification) or secondary measures (flue gas treatment) can be used to reduce NOx emissions. One of the most common forms of combustion modification is to use low NOx burners. - In the future, carbon capture and storage (CCS) will undoubtedly play an important part in reducing CO2 emissions from coal-fired thermal power plants. The technology is however still in the process of being developed. - Part of this group is also methodological improvements for calculating emissions records and changes in emission factors due to changes in fuel properties. In 2007, CO2 emissions from electricity and heat production were 10 % higher than in 1990. If the situation in transformations had been the same in 2007 as in 1990 (the same fuel mix, the same efficiency rates of thermal power plants, etc. 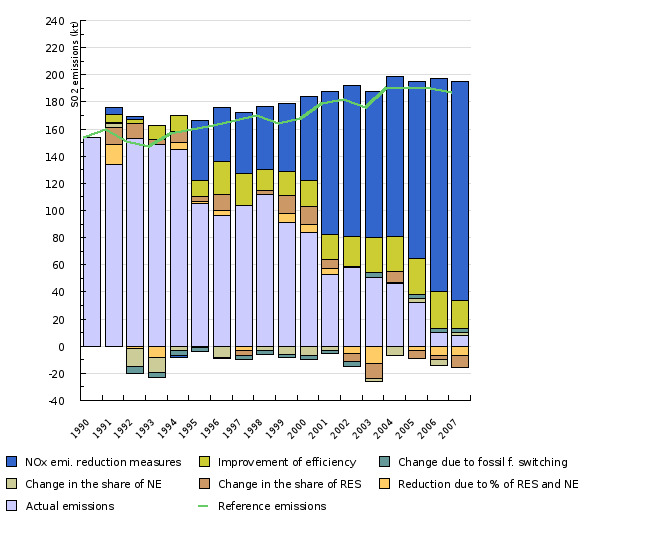 ), emissions would have been 21 % higher – the same increase as that of electricity and heat production. 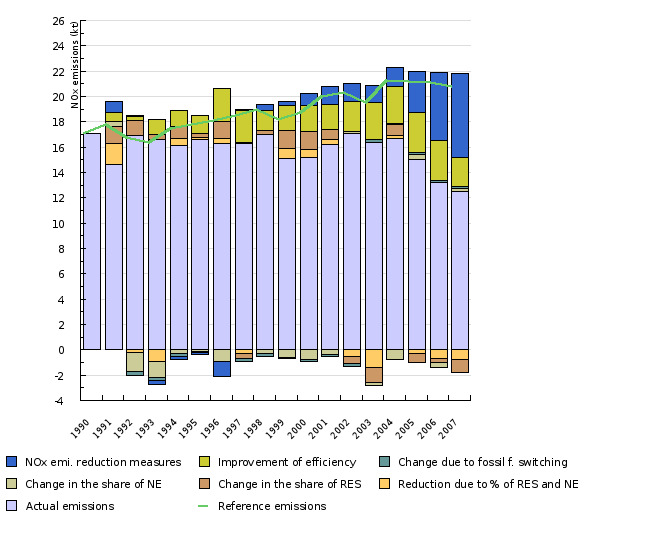 • As evident from Figure 1, emission reductions were mostly the result of improvements made to the efficiency of devices for electricity production which was achieved by optimising the operation of existing devices. In 2007, production was 14 % more efficient than in 1990 but 3 percentage points less than in 2006. The lower efficiency result was mostly due to a lower demand for heat. In the future, the construction of new devices is expected to substantially improve efficiency rates. • In 2007, the quantity of produced electricity and heat from renewables (RES) and nuclear power was 18 % higher than in 1990 (117 ktoe), which is less than in 2006, when production was 20 % higher (135 ktoe). As electricity and heat production from fossil fuels increased by 25 % (143 ktoe), the share of production from fossil fuels was 3.7 % higher than in 1990. Due to the increase in the share of fossil fuels, the impact of this measure was a negative one – emissions increased. In all the years, this share changed, as electricity production from RES depends on river capacity while annual production of electricity in a nuclear power plant depends on the duration of overhauls and partially also river capacity due to cooling. The year 2004 was a record year as regards electricity production in hydroelectric power plants and the year 2005 in the nuclear power plant at Krško. After the construction of the chain of hydroelectric power plants on the lower Sava river and completed refurbishment of existing power plants, the capacity of hydroelectric power plants will increase but not sufficiently to present a substantial growth in the share of RES in electricity production, as the fast growth of electricity consumption causes growth in production from fossil fuels. • In 2007, coal was still the main energy source in thermal power plants and the minimal reduction in CO2 emissions due to fossil fuel switching is the result of exchanging liquid fuels for gaseous fuels. In 2007, CO2 emissions per unit of fossil fuel used were 0.4 % lower than in 1990. In the future, the construction of new gas-fired thermal power plants to replace coal-fired ones is expected to generate a better impact of this measure on reducing emissions. • In addition to factors related to fuel consumption, emissions are affected by changes in emission factors for lignite that depend on the carbon content of lignite. In the 1991-2000 period, this emission factor was lower than in 1990, while in the 2001-2005 period, it was approximately the same as in 1990. In 2006, it was substantially lower and in 2007 again almost the same as in 1990. In 2007, emissions reduced by 0.6 % due to changes in the emission factor. Multiplying the impact of individual measures provides us with the change of emissions in 2007 as regards the year 1990. 1.213 (increase in electricity production) x 0.881 (efficiency improvement) x 1.036 (fossil fuel switching) x 0.996 (emission reduction per unit of used fossil fuel) x 0.994 (change of emission factor) = 1.096 (increase in CO2 emissions in 2007 from 1990). Linking the reduction in emissions to specific policies is difficult. The results as presented above show estimated impacts of individual groups of measures. The implementation of individual measures is facilitated by different instruments. The increase in the share of RES is for example facilitated by the feed-in tariff system, financial stimulations (subsidies, loans) and the certification of energy sources. Furthermore, other standards for implementing individual measures of course also play an important part, especially in electricity and heat production (e.g. reliability of supply and market conditions since the natural gas and electricity markets opened). • The most important contribution is that of abatement techniques, i.e. flue gas desulphurisation, replacement of high sulphur content coal with coal with a lower sulphur content and a reduction of sulphur content in liquid fuels. This caused a 95 % reduction in 2007 from 1990. • The second group of measures with regard to the quantity of the impact is the increased efficiency of devices. Efficiency of electricity production increased by 11 %, but was lower than in 2006. • Impacts of the other two groups of measures were small. In 2006, the share of fossil fuels and wood biomass was 3.7 % bigger than in 1990. The increase in the share of cleaner fossil fuels affected the reduction of emissions by 1.7 %. 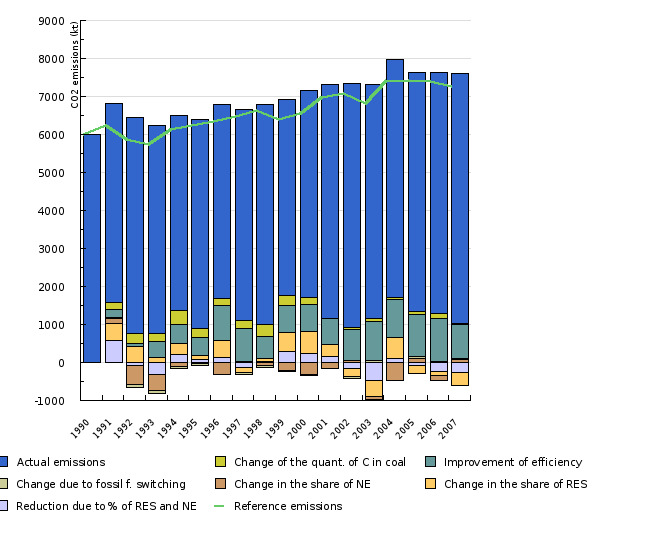 The overall multiplicative impact of these groups of measures and increased electricity production again provides us with the total reduction of emissions in 2007 compared to 1990 levels. In a similar manner to CO2 emissions, future investments in new capacities allow us to anticipate further increases in the efficiency of production and a reduction of SO2 emissions per unit of used fossil fuel. • using fossil fuels with lower nitrogen content (from liquid fuels to natural gas) – a 0.9 % reduction. The 3.7 % increase in the share of fossil fuels and wood biomass resulted in a minor reduction of emissions. In the future, it is anticipated that new investments will result in further reductions of emissions, both for SO2 and CO2. - EEA, 2008. EN09 Emissions (CO2, SO2 and NOx) from public electricity and heat production - explanatory indicators. - Ministry of the Environment and Spatial Planning, 2006. Operativni program zmanjševanja emisij toplogrednih plinov do leta 2012 (Operational Programme for Limiting Greenhouse Gas Emissions by 2012).